Second-generation Camaros are heating up, and this 1978 Chevrolet Camaro LT represents an opportunity to get a car with an awesome classic look, 4 speed manual, newly upholstered interior, shinning silver paint and a Flowmaster exhaust that sounds incredible at a very affordable price. This is a rather cool coupe that is sure to stand out in a crowd or get lots of likes on the road. Under the hood is a stock 305 that is very reliable, smooth and sounds very mean with the new exhaust system. The Saginaw 4 speed is a rare treat on these late 2nd generations and makes this car a blast to drive. The 4 speed shifts smooth and the clutch feels very nice and tight. The drivetrain has plenty of low end torque to get this car moving in a very fun way! The suspension handles very well and drives nice and straight down the road. The interior is newly upholstered and features comfortable black vinyl bucket seats, center console, and a nice black dashboard in excellent condition. Overall if your looking for an affordable, very original fun to drive 1978 Camaro look no further! Note: heater has been bypassed by previous owner. For the 1978 model year, the Camaro featured a new body colored urethane front and rear bumpers. Sales topped all previous years with 272,631 units, of which 54,907 were the Z28 model. Available models included the base Sport Coupe, Type LT, Z28, and the return of the Rally Sport. 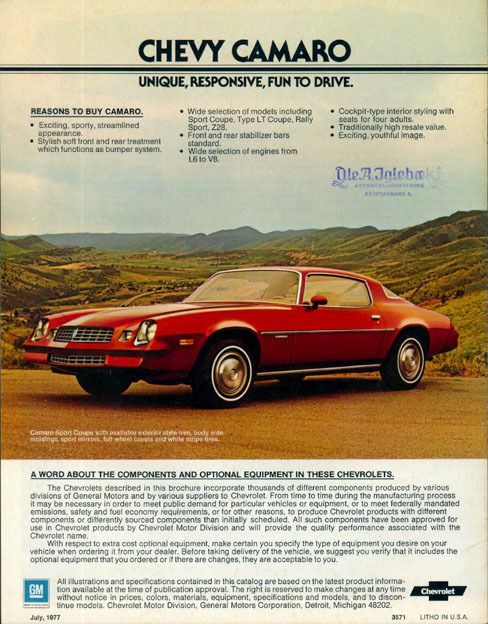 Another first for 1978 was T-Tops, although they were a regular production option on the 1977 Pontiac Firebird and were introduced on the 1976 Pontiac Trans Am 10th Anniversary Limited Edition.